Those will add to my official Fate/Stay Night and Fate/Hollow Ataraxia computer games as well as the box set of JP version Fate/Unlimited Codes Ps2 game with Saber Lily, the downloaded US PSP version, the Fate/Stay Night anime box set and countless wallpapers for the PC, PS3 and PSP. I am actually half tempted to sell the cell phone straps and fan book (it's the one with the calendar, CD sleeves, and mini game with paper people in the back) since I am living here in Japan and have access to be able to get more so that I can share the goodness with all of you back in the states. Any thoughts about that? Also, I'm not sure how legal it is (mods, help me out on this) but if people want 1080P (and an average megs) sized backgrounds of the pictures (un-edited) from the Fate/Stay Night PC game, let me know, I've figured out how to make them and they even look good as a PS3 background on my 42" TV. On a side note, Project Diva "Best" Edition came out today and since I've been looking for it, decided to pick it up. Little did I realize that I was lucky enough to stop in a store that had two of the pre-order sets left! 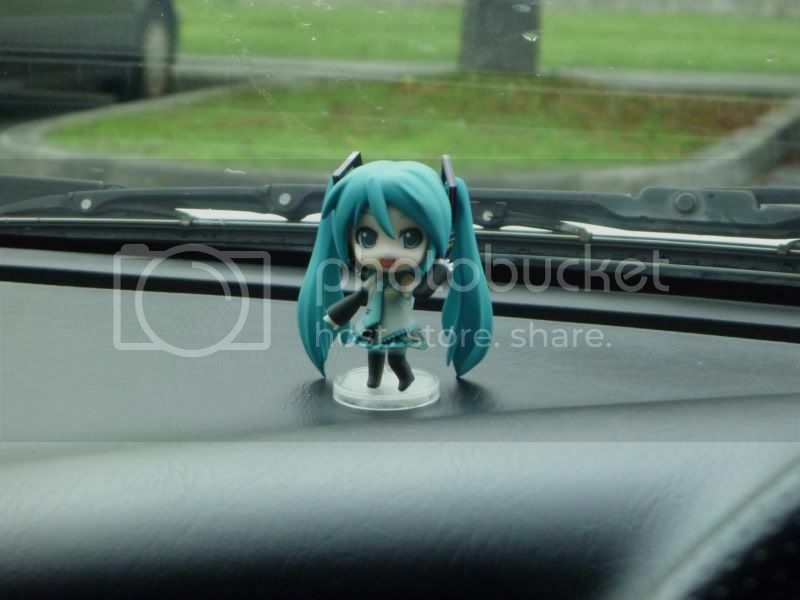 The little nendoroid now has a home on my car's dash. Um... for the backgrounds thing, all you need to do is take the original CG image in lossless (a screenshot taken in fullscreen saved as PNG will do) and just upscale via lanczos to your desired resolution. Turns out that lanczos works VERY well up to around 200% for lossless images that aren't line drawings or pixel art (or 3D with bad aliasing).